Biking in San Diego is great any time of the year. The weather is perfect, and the terrain is surprisingly varied. You can go bike riding on the Pacific Coast Highway in San Diego, along Historic 101, and experience fantastic views of the Pacific Ocean in San Diego. 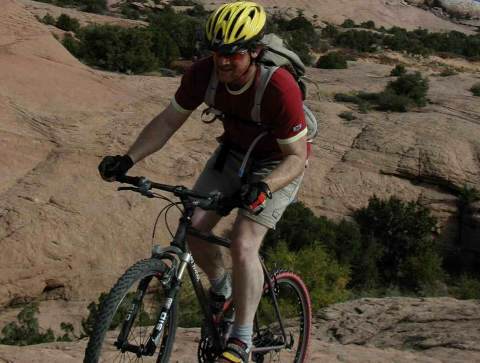 Mountain biking is popular too in some of the canyons, preserves and around nearby lakes. You can even bike ride to work. 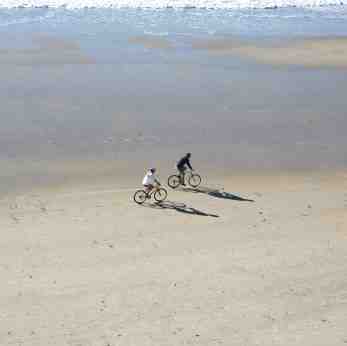 At low tide, enjoy a ride on a wide sandy beach. Or enjoy a short bike ride along some of the beach boardwalks and parks, anytime. So leave your car behind, and enjoy the fun of bicycling in San Diego. 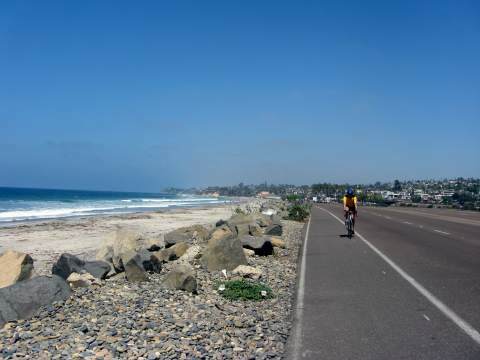 A great route for biking in San Diego is to take the Pacific Coast Highway. If you are coming from Orange County for a day ride, you can park a car at a train station, ride your bike south and hop the Coaster train back for the trip home. You will need to bring your drivers license, as Camp Pendleton, a large Marine base is located at the northern end of San Diego right along the coast. They will let you ride on the military base if you show your drivers license. South of Camp Pendleton, the Pacific Coast Highway is known as Historic 101 most of the way from Oceanside to San Diego. The trip will take you through busy Oceanside, where you can see the 101 Café and the Oceanside Pier. Further south is a quiet ride through Carlsbad, and into Encinitas, where it is worth a stop at the Self-Realization Fellowship Temple Mediation Gardens. The temple grounds are open all days except Monday, and offer spectacular gardens and views of the Pacific Ocean. Just south of the temple is Swami’s surfing spot, made famous in the Beach Boys Surfin’ USA hit song. There are a number of cafes to eat at, including Swami’s Café. The coastal biking in San Diego ride continues through the beach communities of Cardiff, Solana Beach, Del Mar and Torrey Pines. A brief side trip up Soledad Mountain in La Jolla will reward you with spectacular views, before descending into the beach communities of Pacific Beach and Mission Beach, in the heart of San Diego. You might want to save your energy for biking Point Loma and Coronado for another day. If you want a shorter but scenic San Diego coast highway biking route, start at Encinitas Blvd in Encinitas and head south through Cardiff, Solana Beach, Del Mar, and then enjoy the hills of Torrey Pines and La Jolla. The Torrey Pines grade is a challenge. You might want to stop at Torrey Pines State Park and enjoy the spectacular views of the Pacific Ocean. 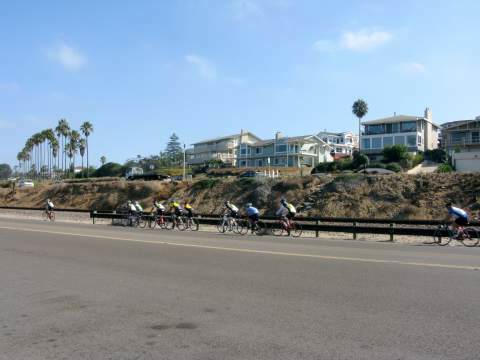 If you are a tourist, bicycles rentals are available in La Jolla Shores and Pacific Beach. The Coastal Rail Trail will stretch all the way from San Diego to Oceanside, as it parallels the railroad tracks along historic 101. 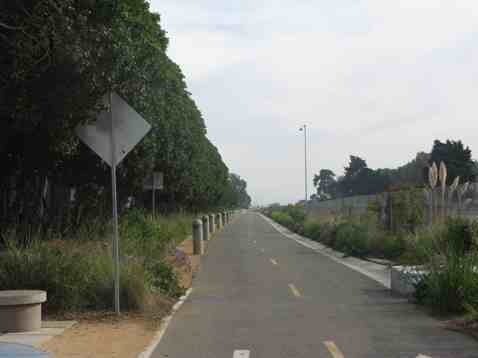 Parts of the trail are completed, such as this section shown above in Carlsbad, and a nice section in Solana Beach. The San Diego Mountain Biking Association recommends a number of mountain biking trails in San Diego county. Check out the San Diego Mountain Biking Association website sdmba.com website for recommendations.